Available now at the Shetland Times Bookshop and also on Amazon. This book covers both my 2006 and 2013 attempts at a non-stop singlehanded circumnavigation. Besides telling the story of the two long trips the book also describes building Elsi and a little pre-history of how I came to do the trips. Copies are available at the Shetland Times Bookshop and also on Amazon. 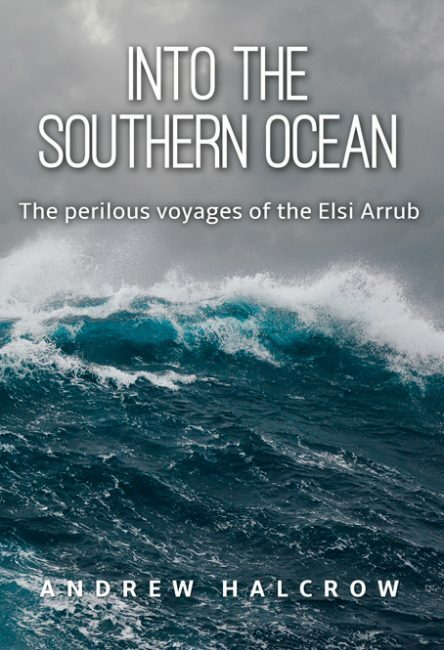 This website is a record of Andrew Halcrow’s attempt at a solo non-stop circumnavigation in 2013/2014 onboard Elsi Arrub. 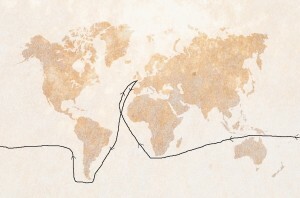 The proposed route was from Falmouth down through the North and South Atlantic then round Cape Horn. Up the west coast of South America, across the South Pacific in the SE trades to the Torres Straits. Across the Indian Ocean, round the Cape of Good Hope and back up to Falmouth. Departure from Falmouth was November 4th 2013. Andrew would like to thank everyone who has helped in any way or has passed on good wishes. Congratulations and may you have favourable winds and warm weather. I have noted the two bear crew you have on board! Hope all goes well with lots of amazing experiences along the way, safe journey…..
Take care Andrew and best o luck. safe trip — favourable wind — good luck!! Watching your moves and hope the gales abate in double quick time. Missing your boat in the Marina! Get yourself a nice suntan the next few weeks! Remember to brush your teeth, I’ll check when you back! From one seaman to another, watch how ye go and be safe, I will follow your progress, Fran fae Ayrshire. Watching your progress, keep safe and hope all goes well enjoy the adventure. Looks like he is on his way. Glad you’re on you way this time Andrew. It looks much more favourable – Don and I are thinking of you all. Best wishes for a good trip and a safe return. Take care. All the best, Frank. We will watch your progress with great interest – some adventure. Greetings from SHETLAND, Andrew ! Wish you a fine trip and good luck ! I’ll give you shout on 21.320 MHz +/- qrm at 1500 hrs. GMT during the incoming week. I never knew anything about your journey until now.. just found out about it on the internet.. I still have very fond memories of our various trips on the Swan.. Always admired your adventurous spirit Andrew.. I live in southern Norway now.. Onywye aa da best on your trip!! Andrew from the Cape Horners, we wish you all the best it was your friend Jan Wit who has kept me in touch I hope for your success. It is such a big world and we all see so little of it I salute you the adventurer. Wow!!! Just heard you are living your dream. What awesome!!! Have a wonderful sail. We have bookmarked this blog and looking forward to reading your adventures the coming months. Don’t forget to wave to Cocos when you sail pass. Arno and Olga. Hi Andrew, Chris Johnson your old school and Sullom Voe chum here. Just recently discovered that you had a blog to go with your journey. Thoroughly enjoyed the history and pics (did we really wear those jumpers!) 7as sadly what you were up to passed me by at the time. Just wanted to wish you a Merry Christmas and a safe journey. I’ve always had tremendous admiration for what you have done and are doing. If you can manage to come on the air during the next few days or so, I’ll take a listen for you on 21.250 MHz at 1200 GMT. The propagation forecast looks promising. wish you all the very best from the Isle of Lewis. God Bless. Hi Andrew, its nearly 2014 in i wiss de all da very best and a safe journey, look forward ta reading aboot dy progress. Hears tae wiz, wha`s lek wiz, damned few. Cheers Peter. Keeping tabs of you and “Elsi”, good that your making the miles.All the very best for 2014 to all. We’ve just talked to you in Santos Basin in the coast of Brazil at 19:45 local time. I am the radio operator on board of the seismic survey vessel Western Neptune and I wish you all the best of luck on your non stop trip around the world. I hope someday you drop by in the Port of Malhado in the city of Ilhéus in the State of Bahia-Brazil that’s where I live. We are a bunch of Ham radio operators running Winlink 2000 WINMOR and Pactor HF SSB email servers along your route. Please give your Winlink 2000 webmail password to your wife to read all your emails and pass it on to you via sat phone. She can then clear your inbox, in order for your future radio connections to be brief. Build easy vertical dipoles cut for each band of operation. No counter poise and antenna tuning required. We should be in your channel list. Don’t try to update this channel list via radio, this might take way too long. Looking forward to hearing you connect again. We are still thinking about you . Can’t wait to introduce you to craig . Keep you’re pecker up see you back hom later this year. Just amazing!!! best of luck and fair winds…. Hi Andrew from Australia. Good luck on this new voyage, safe sailing, smooth seas! Im not sure if our previous comments made it: but we totally enjoy reading the logs. By the way, our word for fancy albatrosses, etc (yeah we have wood stork, great white herons, small ibises, etc etc.. right outside our back window on the right day – regular folk on figuring out birds) but we tend to call those albatross types a “terradactyl” (ya know, that would include pelicans, etc). So in our neck of the woods, they are birds that eat your next lunch – so beware! Anyway just enjoying your diary and Alyson’s input. While we are a little worried on safety issues (and still have to google a lot of terms to understand what you are talking about on “F” this and “F” that on speeds or winds or something) but just enjoying the educational experience, we are thoroughly enjoying the reading of your journey! God speed through the Cape! Dave and Becky Riser (Ruth Moss = sister). To ALYSON: please feel free to edit ANY submissions we make to suit 🙂 We really are enjoying watching the journey, and have a bunch of folk watching the progress. You are a champion, and love that we can enjoy this – its something really “out of our dots” so very good to enjoy from a nice comfy couch :). Hope you are doing ok – and staying somewhat warm (if you are back in the frozen scottish north!). Hopefully you get these submissions and decide what is good to post! Take care. Becky Riser (Ruth Moss’ sister). I have received your previous comments and approved them – Thank you – its great that our US “rely’s” cos you are via Ruth, are keeping up with Andrew and his quest. Windy here too. Hope Elsi Arrub is goin well and you are too. Fire festival season is underway. Scalloway had great weather. Cold and still. Mhairi and I went to Hamnavoe Hall and had a super night. Hope you get Fair Winds. hi andrew .. glad to see that you are at it again.. In the course of preliminary research into the building of a Tahitana and a desire to be informed of it’s sailing capacity I have had the extreme good fortune to have encountered your website and published log. I will be marking it to my desktop for a daily reminder of what and how a good life should be lived. Study plans for construction have been sent for this week and I have already begun a translation of the table of offsets floating around the internet to a 1/3 scaled version which I hope to use to complete a scaled hull this winter to study the neccessary geometry of plating. It should keep me occupied during the winters slow construction period. I operate a single owner fabrication business and have been in the trade my entire working career. Did 6 years in the marine industry but all of it on commercial vessels so yachts and sailboats will be something quite new. I doubt the time that’s been spent studying the subject in books, while possible helpfull, will compare to the actual doing. Wanted to take this opportunity to wish you the very best in your voyage and thank you for setting an example the rest of us armchair types should take heed of and pay attenton to. Fair Winds. From your 2nd cousin once removed in-law. If du’s tinkin “Wha’s yun?”, ask dy mammy. Best wishes for a successful journey and a safe return. The pattern that you see on the topside are cut pieces of grip adhesive material. The material is a sand, usually obsidian I believe, that is glued to a backing with epoxy. This adheres to the deck via more glue on the backing. The pattern is likely the work of a man with a lot of time on his hands, and a lot of interest in making his deck look more interesting. A solo navigator (I am for the moment, though I haven’t gotten far) tends to put little extras into the ship as the ship is more than just a vessel, it becomes a companion. Creating a pattern like that is actually a clever idea as it gives him something to do on long voyages. It also allows tendencies to hallucinate to be given what I would guess would be healthy exercise – looking for objects or patterns in the maze of cut pieces would be a healthy way to wile away the lonely hours at sea. Also, remember that Halcrow built this ship himself. He takes great pride in it, and she has saved his life and her own twice now. That is how I know he will try this again. She has proven seaworthy even if she was dismasted in rough weather. Andrew is probably right now trying to figure out how his mast broke and how he can prevent it happening again, even if he is still shaken from the weather. He did, after all, successfully round the horn. Best wishes for a safe and interesting journey! Following your progress with great interest here in Shetland. Well done on the great progress so far! I’m sure you’ll be relieved to get round the Horn and now focused on heading north and eventually getting some warm trade winds filling the sails for the down hill run! Fair winds and have a safe trip across the South Pacific. Do you have plenty of fishing lures? Well Done Andrew and Elsi. Following your progress with great interest and pride. Keep safe. Im keeping an eye on you oot yunder in da big bloo see. I mind as a peerie boy standing in your shed when you wirr building da Elsi Arrub an you telling wis your plans ta go around da world. Weel I canna believe you’re at it again. All da best, and keep safe and enjoy every meenit. Hope your voyage goes well, shetlander in Australia watching your progress . Glad you made it round the cape safely.look after yourself .save sailing James Balfour. , Perth WA. Keep it up! Your doing well! See you when you get home! Best wishes for a fine passage Cape Horn does not look like a place to stop for long. Will see you in the Small Boat harbour in Lerwick alongside the Swan in August 2015. Hi Andrew, I was wondering what the radio propagation is like now that you getting more to the east. Do you hear any UK amateur stations on the air. If so what are the best frequencies and times? Nothing you could have done. Freak accident. Gutted for you. Very sorry to hear news of the dismasting, but glad that Andrew has been picked up and is safe and well. Really sad to hear that you have been thwarted by storms breaking your mast, you must be feeling so, so devastated. Great to know that you are safe and have survived the storms. We met as you were leaving Scotland to begin your journey, at Crinan in Argyll, I am a crew member of ‘An Sulair’ a classic wooden yacht. Andrew is safe now? what happened with the sailboat? Congratulations on surviving another attempt. Your efforts are not wasted Mr. Halcrow. You are doing what few can even dream of doing and are an inspiration to us all. I do hope you will try for another attempt, perhaps with a stronger mast, or perhaps a bit more patience with the weather on the Horn next time around. I do look forward to your blog entry describing the events. I myself would love to attempt the horn one day, perhaps solo, perhaps not. I’m in a ferro-cement yacht, though I didn’t make her though I am the first to sail her. Good luck and we’ll see you out there some day. 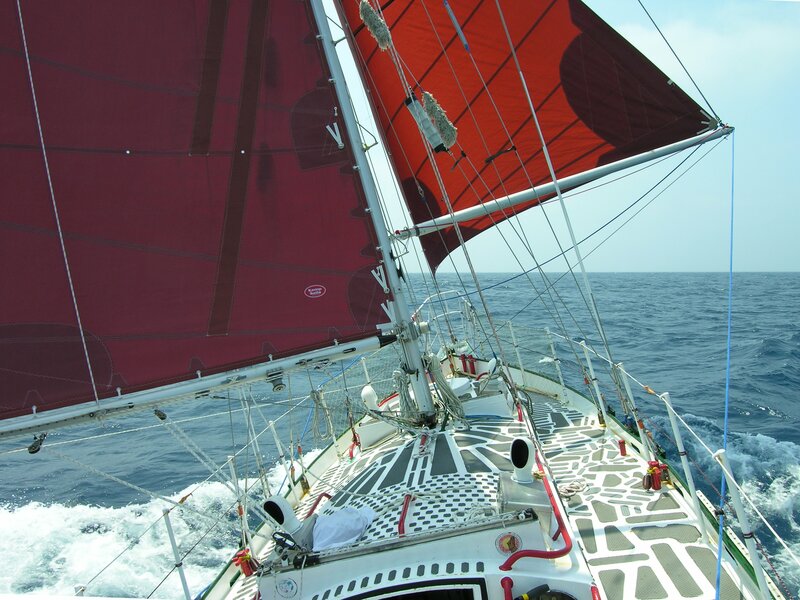 Hi There from Bruce Stewart and Dot Nicholson in Australia, is it time to start a “get the boat back and buy a new mast fund”? Regards from down under Bruce and Dot…. Hello Andrew! So sorry to hear about your mast…..very bad luck. I was, however excited to hear about you and the second attempt. I have retired from teaching and hope to be doing a lot more sailing…..:) The kids are all really grown up now- even wee Harry is 22! Best wishes…will you be able to recover the boat? Hi, Andrew,,got in a buckle a sh… Tryin ta send a message twartree days ago. ( just whin I tocht me an dis ipad wis called a truce !) wis so impressed at da calm wye du set aboot cuttin awa dy mast in datn heavy seas at a time whi du hed tae a been sae upset too. Bit dy followers is been astounded aa da wye trow wi dy seamanship an perseverance . Dee an elsi is gien wis so much inspiration aa winter . Do hope du gets her back. Yuns a wild coastline right anyoch , bit elsi is a tough peerie boat . Best wishes. darn sad that the mast broke, but so happy you are home safe!. BUT where is Elsi eh?!! Just wondering with your maritime skills, maybe you can help Australia / Malaysia figure out this last maritime disaster (the flight that bombed while you were “en route”)? Hmm they may need some on the ground “common sense” ehh? and I guess its every serious yachties dream to do and join the club of being an “Earth Rounder”. this is unfinished business and it must be resolved. Obviously the monetary situation is hard but not insurmountable. I can very much see it happening a third time, no question……maybe market the idea as “Round 3”…..
Have tried to answer your e mail, but the Shetland Gurus have sent it back. So hopefully this makes it ? So, thank you for your e mail + welcome home ! By coincidence I was in Falmouth lat week + went along to Pendenis to try + find your postal address. I was going to drop you a line. You must be gutted + I am so sorry that you have lost your boat. Our boat is very dear to us, but all we did was write a cheque for her. You have put life + soul into Elsiarrub so it must be very different. Not much more I can say, but I am so sorry. 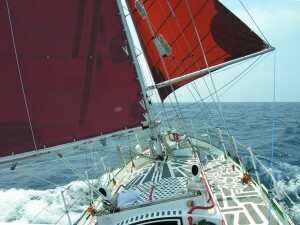 Having made a channel crossing last year with the aid of my Ray Marine I am in complete awe of what you have achieved. And don’t say never again. I see that Robin KJ at 75 has just put an entry in for the Transatlantic race But it may an idea to enjoy spring in The Shetlands first. I remember looking at that mast in Falmouth + was convinced it was bullet proof. But you are safe + have achieved a massive amount. Life can change in a flash. On the 10th February I was paying my daily visit to your log + learning about Isla Lennox, when Liz shouted from up stairs that she was in great pain. Our doctor arrived + Liz was blue lighted to QE Hospital in Birmingham. Within hours she had an emergency operation for a cerebral haemorrhage. It was very difficult for a few weeks but Liz is now home + making slowly gaining strength. It could have ben very different. So a quiet life for a while. We have a great deal to be thank full for. Life is sweet. So when you fancy some gentle sailing on The South Coast give me a ring. In the meantime take care + very best wishes to you + the wider family. Very glad to read you are OK. I hope you don’t mind me getting in touch with you. I’m a researcher working for the TV production company Darlow Smithson, whose credits include “Richard III: The King in the Car Park” and “Touching the Void.” We’re currently working on a new series for BBC Earth/Channel 5 focussing on British people who have born witness to extreme weather conditions in possibly life-threatening circumstances whilst abroad. In the course of our research we came across your website, and I wanted to enquire how happy and willing you would be to potentially contribute to the series by sharing the details of any stories you may have from your travels of experiencing extreme weather events, as we feel any such stories would work really well in the series. We’d also be interested to hear about any footage you may have shot as events unfolded, as the series would be a combination of interviews with the participants and user-generated footage. Please do get in touch at your earliest convenience if this is something you’d be happy to chat to us about. I look forward to hearing back from you. I’ve just finished your excellent book which I thoroughly enjoyed. The pictures you painted in my mind’s eye were vivid, with your writing style immediately enjoyable. I really had no idea of how it must be attempting to circumnavigate the globe on your own….I now have a peerie insight!